Dahlias are planted from a tuberous root. These roots should be planted outside in spring 1-2 weeks before the last frost date (or start earlier indoors in pots) in organically rich, medium moisture, well-drained soils in full sun. 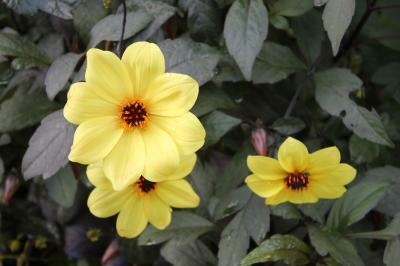 There are many, many varieties of dahlias with ranging heights and flowers shaped and colors. 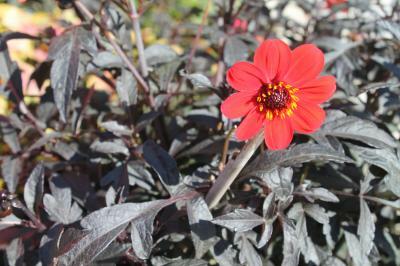 The taller varieties of dahlias should be planted 6-7" deep and shorter varieties to 2-3" deep. Spacing will be about 1' to 3' apart, depending upon size of variety. Those taller varieties are also likely going to need some staking. For me, dahlias have been pretty low maintenance except for the occasional deadheading of spent flowers to promote growth of additional flower buds. They do best when consistent moisture is provided during the growing season. There has been several times where I've let my bed dry out too much and the flower production greatly diminishes when that happens. The one downside to dahlias is that they are only hardy to zone 7 and need to be dug up and stored at the end of the season. After the first frost, gently dig up the tuberous roots. The root system of dahlias is shallow and quite extensive, so begin your digging at least a foot away from the main stem to avoid slicing into the tuberous roots. Remove the foliage and leave a three to four inch stem on the plant. Gently remove all soil from the roots, and allow them to cure and dry in a shady area with good air circulation for a few days. Dust with sulfur to inhibit fungal diseases. Store the tubers upside down in damp vermiculite or peat moss at temperatures between 35 and 50 degrees F. If you notice the tubers have shriveled over the winter, water lightly. So there is some work involved with dahlias, but I think the reward is great! 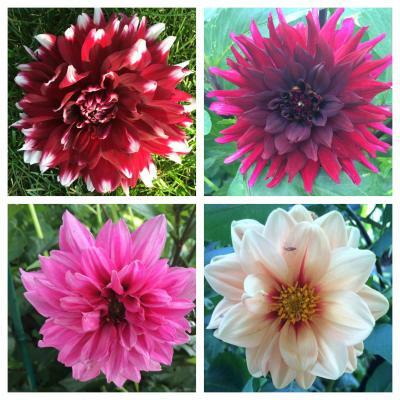 Learn more about growing dahlias here and here.